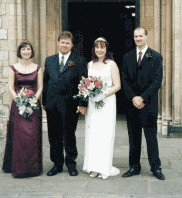 Maxson Music has over twenty years’ experience in providing music for weddings. Whether you want music for a church service, a civil ceremony, or for a wedding reception, we have musicians who can make your perfect day extra special. These can also be provided in any combination, for example an organist and soloist for a church service, with a string quartet at the reception. Contact us to find out how we can make your special day even more special. This entry was posted in Uncategorized and tagged Arts and Entertainment, Bands and Artists, Music, String quartet, Wedding, Wedding reception, Wedding ring. Bookmark the permalink. Pingback: Wedding Musicians: Which instruments should I choose for my wedding?